A gem of a gallery and a must visit if in the area. On our way back from a very wet Easter break in the Perche region of the Orne in France, the sun shone – we were on our way back after all – and we decided as we were close by to drive to Giverny to visit Monet’s house and garden at a time of year we hadn’t been before. What a joy! The house and gardens had only opened a few days before and compared to the queues and crowds that beset it later in the year it was virtually empty – we even went straight in to buy our tickets – no queue! But that aside a visit to the Musée des Impressionismes a little way down the road from Monet’s house – which had only opened the day before revealed an superb exhibition, as it always does. Our last visit had one devoted to the wonderful Spanish Painter Sorolla. 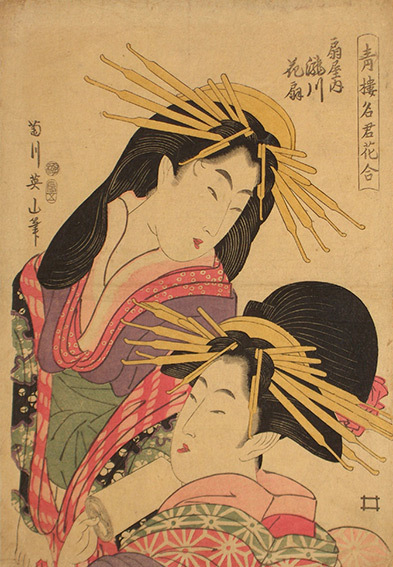 This time the show shone the spotlight on the importance of Japanese art and principally the woodblock print had on Western art in the second half of the 19th century, not only in terms of composition and perspective – or rather the lack of it, but also in the flat areas of pure colour, with the absence of shading. 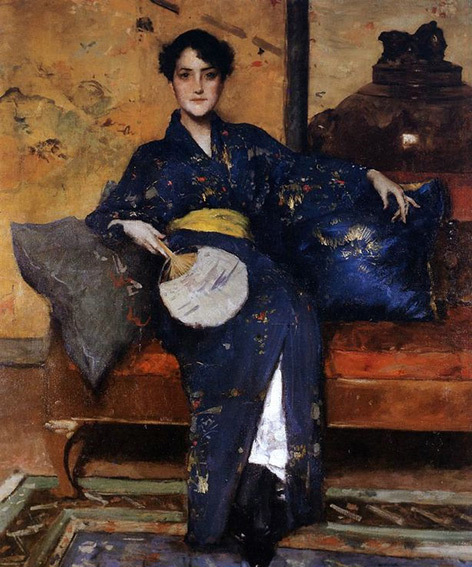 Monet himself had a large collection of Japanese prints – many of which can be seen in his house, and there are alarge variety here along with works principally by the Impressionists and Post-Impressionists, but also including some gems such as the painting illustrated by the American William Merritt Chase. 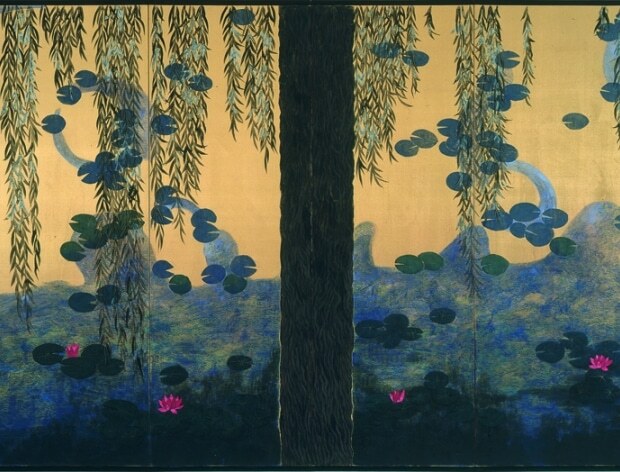 In the small room in the basement of the museum was another gem and this time of a contemporary Japanese artist previously unknown to us, Hiramatsu Reiji who had done a series of paintings and screens, influenced by Monet’s Garden, particularly the water-lily pond. Entitled “Bassin aux nymphéas – Hommage à Monet. His works are painted using the traditional technique of “nihonga” which literally means Japanese (nihong) and painting (ga). It is basically painting on paper or silk using brushes and finest mineral pigments derived from natural ingredients: minerals, shells, corals, and even semi-precious stones like malachite, azurite and cinnabar. The raw materials are powdered into 16 gradations from fine to sandy grain textures. A hide glue solution, called nikawa, is used as a binder for these powdered pigments. In both cases, water is used as a medium. Gofun (powdered calcium carbonate that is made from cured oyster, clam or scallop shells) is an important material used in nihonga. Different kinds of gofun are utilized as a ground, for under-painting, and as a fine white top color. 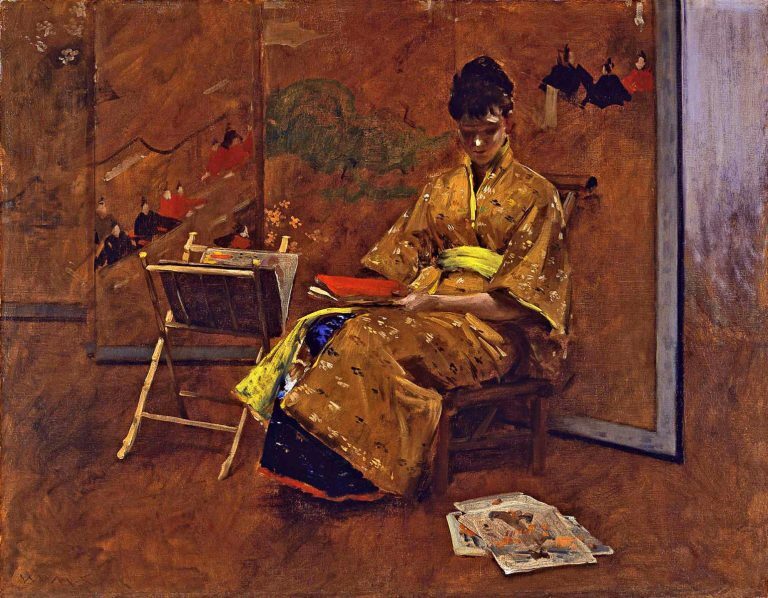 As a term its origins are in the late 19th century, introduced as a way to preserve tradtional, yet modern, Japanese painting in the face of the ever prevalent Western style of painting that flooded the country after the opening of Japan to the west in 1868.